← A trip to the framers. 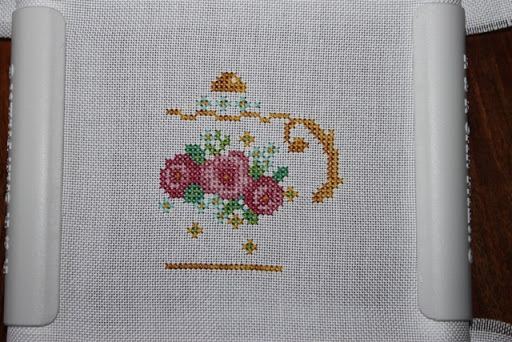 With my Aunts birthday coming up on Sunday I wanted to stitch her a little picture of something. 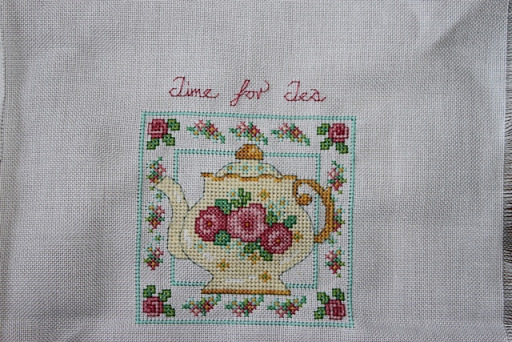 I picked a chart of a teapot from Cross Stitch Crazy this month, issue no 148. The chart I’d picked had one of the symbols missing and after emailing the magazine they were able to track it down for me. I started it last night and decided to stitch it on evenweave as the finish is better. Here is a picture of what I’ve done so far. The teapot after one evening. More pictures to follow as progress is made. Here is a picture of the teapot just before framing. The teapot before being framed. It took me 2 and half days. 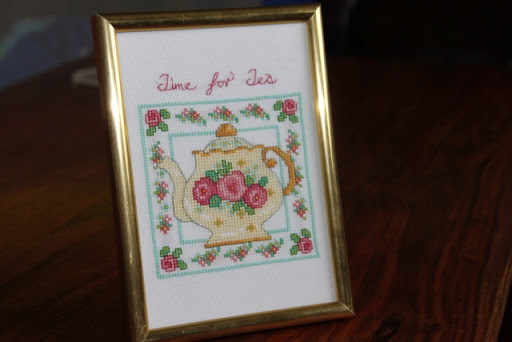 I adjusted the design from the magazine a little bit as I couldn’t find a square frame so to make it a bit longer I took the “Time For Tea” out of the frame and put it at the top, then filled in the border top and bottom with the flowers from the side. Here is the teapot now all finished and framed and ready to go to my Aunt.